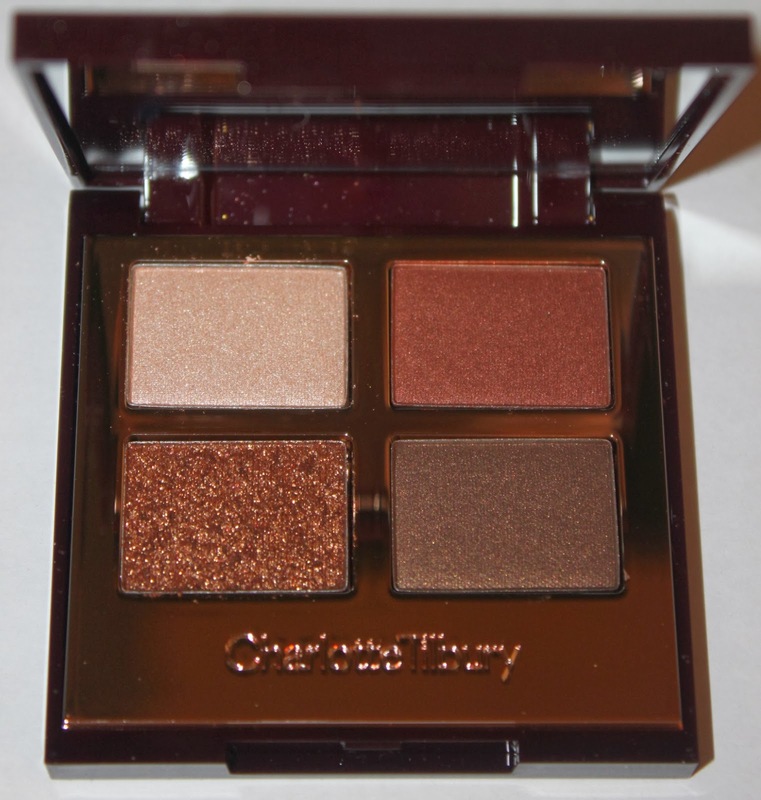 I am excited to be sharing with you the first of my four Charlotte Tilbury eye palettes-The Dolce Vita. I was a bit worried as a few if the initial reviews were ambivalent or negative. I had already ordered mine so I waited eagerly for them to arrive in order to judge for myself if these were going to be as dreamy and amazing as I had hoped them to be. I should not have even doubted them, as my previous Charlotte Tilbury purchases were excellent and on par if not better than other luxury brands (I have previously reviewed here eyeliners here and The Retoucher concealer here). The ripping of my Selfridges yellow spotted tissue paper was audible as I just wanted to dip my fingers into these unmarked buttery pans. Eureka!! -I had hit gold. My fingers were immediately stained with smooth, creamy pigments – I breathed a sigh of relief !-Yes they were everything I had hoped for! The packages, yes, is similar in colour and look of Tom Ford. It does not have the heft of a Tom Ford eye quad- but in my mind this makes them more portable. Each pan is smaller than a Tom Ford one. The back of the packaging has Charlotte’s diagram of how to use the palette, which works well with her Youtube videos on the corresponding looks. So if you are a beginner in makeup application, or willing to learn more from Charlotte herself, pop over to her tutorials. I just love her nonchalant manner and cool Brit chic. 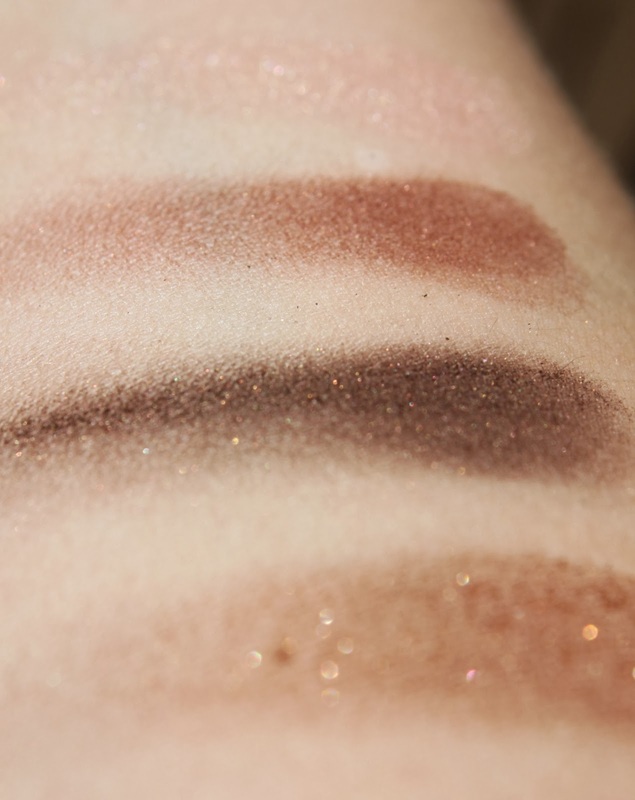 The Smoke shade – Dark brown matte/satin hybrid ?? All shades are highly pigmented, creamy (yes I said creamy again) and smooth to apply. The glitter shades is best patted on to minimise fallout and to get maximum impact. This palette a day to night to perfection. On my first day of wearing two compliments only goes to show how nice this palette is. Charlotte, you are winning such a place in my heart! Ooh, they look so beautiful. I am guessing this is even warmer than Cognac Sable? Like Burnished Amber and Cognac Sable married and had a child? 😉 is the darkest shade really matte? SUCH a beautiful palette! I don't think they have her line in the states, but it looks like a great neutral compact. I love that there is a matte crease color. If you can – hop over to Selfridges- they now ship to the US- The Sophisticate is the most neutral palette with all true mattes!! Yes it is warm! I am already choosing my next two – Rock Chick and Golden Goddess – oh heck! might as well and make it a hat trick- vintage vamp too! since burgundy shades are so on trend. What are u choosing next? Hi Sara- Indeed a golden child has been born ! I have just done some quick comparison swatches on my hand- the main two differences are the lightest shade and the POP shade. The Prime shade in the CT is slightly more pink toned than the TF and the POP shade is more brown where the TF shade is more ginger. The other two at a glance are almost dupes. ))Oops mixed the pop and enhance shades up (fixing now) in my hurry to get post up. The enhance shade is similar to an Addiction matte as it is like a satin as it is creamier than a traditional matte that tend to be chalky- so I guess a hybrid of matte and satin. lol i love saying "the same but different" – my parents used to make fun of me as a kid, and i still say it now! Glad to hear you are enjoying it! It is a perfectly perfect saying!- just sayin'! lol Really a wonderful palette! This list is growing- now the new gold illuminating bar- ugh! I know, ugh! I want to wait till I see some swatches of it though before ordering in case its too yellow toned. I'm really happy to find your blog because i'm really curious about differences between TF and CT! I'm in South Korea and there's no shop of TF also CT in here. So it's ok to ask you an question about them? I wonder that CT is harder to color then TF 'cause CT color looks little bit faint? weak? than TF's in photo. Anyway I love that saying "the same but different". It's really true in cosmetic. There is similar saying here, "There's nothing same color (cosmetics) under the sun." This particular palette for CT is as pigmented as TF .On a whole I find them quite strong in colour and just like TF..None of them are weak or sheer. I love both CT and TF as the quality and colours are excellent , long wearing and well pigmented. We also do not have CT or TF counters in my country -I have not been disappointed with either brand. I think your saying is fantastic! !- just implies the possibilities are as endless as the stars in the sky-love it!